On September 21st, 2017 renowned Spanish artist, Vicente Peris brings his solo exhibition, La Sombra, to Los Angeles, California. La Sombra, his new three-piece interactive installation, will be on view at the 560 S. Main Street #7N, Downtown, Los Angeles. Translated as The Shadow, Peris places the boundaries of visual language aside with La Sombra’s installation exhibition pieces presented as parts of a whole joining together to create a full, non-linear, interactive experience. The three parts of La Sombra: La Sombra Transparente (“The Transparent Shadow”) stands as a 200 meter painted installation, uses emulsified gunpowder to etch the shadows of suspended dancing figures onto Peris’s canvas. La Sombra Pintada (“The Painted Shadow”) features doors that can be opened to reveal paintings of one’s true self. It is a commentary on how little information a glimpse of someone may reveal to their viewers, but can also be understood inversely. La Sombra Libertada (“The Liberated Shadow”) makes use of revolving doors. The mobiles provide the canvas for a shadow game of soccer that the viewer can walk through. The antithesis of the shadows in La Sombra Transparente are not a reminder of the past, but a representation of the present. A culmination of his earliest art experiences, La Sombra speaks to Peris’s greater commentary on the soul. He states, “We come from light, the sun. Everything that is illuminated has a shadow. Every shadow has a soul.” Peris draws attention to humanities’ similarities in an extremely divisive time. La Sombra reiterates a universal fact, all humans exist with both a shadow and a soul. 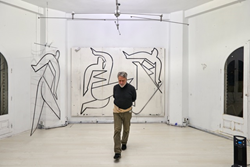 Bio: With a career spanning five decades and counting, Vicente Peris is internationally recognized as one of Spain’s most inventive and era defining artists. His numerous solo exhibitions in Europe, South America, and Mexico include those in museums, galleries and performance spaces such as Museo de Bellas Artes de Valencia, in Spain; Museo de Arte Moderna Aloisio Magalhäes, Recife, Brazil; and Instituto Cultural Cabañas, Guadalajara, México. He has participated in many group exhibitions that were held at the Ministerio de Cultura, Madrid, Spain; and the Fundación Pequeño Deseo in Madrid, Spain; among others. Peris’ La Sombra Transparente was the artist’s first exhibition dedicated to this impact of shadow. As his perpetual inspiration, Peris is now taking ‘the shadows’ to Los Angeles, California in the artist’s latest oeuvre, La Sombra. More can be learned about Peris at http://vicenteperis.net/.